Contents: Introduction, Allyson M. Poska, Jane Couchman and Katherine A. McIver; Part I Religion: The permeable cloister, Elizabeth A. Lehfeldt; Literature by women religious in early modern Catholic Europe and the New World, Alison Weber; Convent creativity, Marilynn Dunn; Convent music: an examination, Kimberlyn Montford; Lay patronage and religious art, Catherine E. King; Female religious communities beyond the convent, Susan E. Dinan; Protestant movements, Merry Wiesner-Hanks; Protestant women’s voices, Jane Couchman. Part II Embodied Lives: Maternity, Lianne McTavish; Upending patriarchy: rethinking marriage and family in early modern Europe, Allyson M. Poska; The economics and politics of marriage, Jutta Gisela Sperling; Before the law, Lyndan Warner; Permanent impermanence: continuity and rupture in early modern sexuality studies, Katherine Crawford; Women and work, Janine M. Lanza; Old women in early modern Europe: age as an analytical category, Lynn Botelho; Women on the margins, Elizabeth S. Cohen; Women and political power in early modern Europe, Carole Levin and Alicia Meyer. Part III Cultural Production: The Querelle des femmes, Julie D. Campbell; Intellectual women in early modern Europe, Diana Robin; Women in science and medicine, 1400-1800, Alisha Rankin; Early modern women artists, Sheila ffolliott; Beyond Isabella and beyond: secular women patrons of art in early modern Europe, Sheryl E. Reiss; Material culture: consumption, collecting and domestic goods, Katherine A. McIver; Images of women, Andrea Pearson; Women, gender, and music, Linda Phyllis Austern; Index. 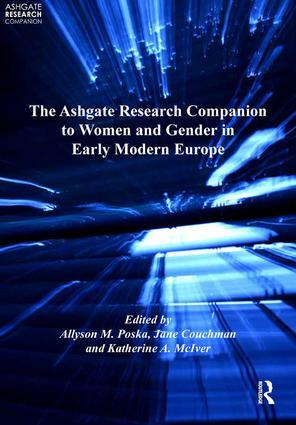 Allyson M. Poska is Professor of History at the University of Mary Washington, USA and co-editor of Ashgate's 'Women and Gender in the Early Modern World' book series. Jane Couchman is Professor Emerita of French Studies, Women's Studies and Humanities at Glendon College, York University, Toronto, Canada. Katherine A. McIver is Professor Emerita of Art History at the University of Alabama at Birmingham, USA.